I recently stumbled upon the images of Bri Emery's living room on Pinterest. Bri Emery is an art director and the Los Angeles-based founder and editor of a lifestyle blog called DesignLoveFest. Her blog is a treat and I enjoyed going through it. Bri's impressive portfolio includes publications such as Elle Décor, Apartment Therapy, HGTV, Lucky Magazine, Martha Stewart Weddings, The Los Angeles times and more. Bri's living room has been designed by her friend Emily Henderson. 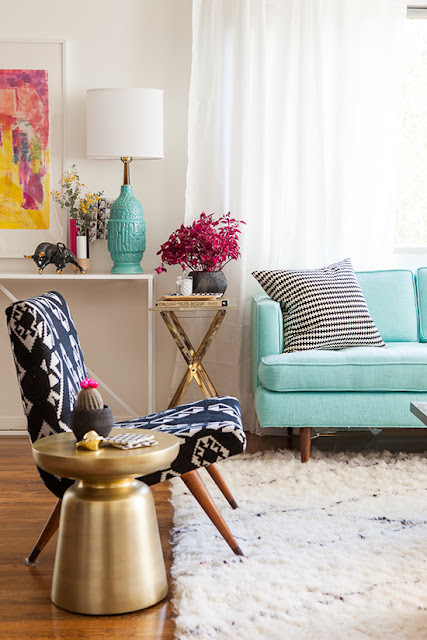 Emily also happens to be an HGTV host, designer, stylist and blogger! 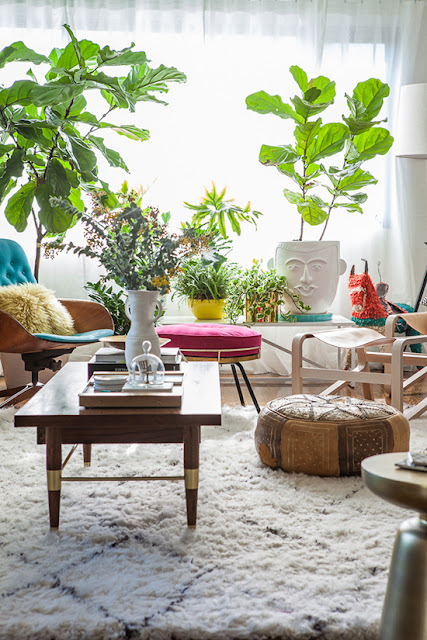 I am drawn to the mix of colors used in this space, the mid century furniture pieces and those gorgeous plants!! The light flowing into the room makes everything look so refreshing!! Do visit her blog for more images of the living room makeover. It is certainly inspirational! Images: via DesignLoveFest. photos by: Laure Joliet. Loving the fuchsia/turquoise combinations more and more each day, and this is coming from a primary colours girl!